I was in Tarjet Friday specifically to buy Sonia Kashuk's version of the MAC #187 skunk brush. I ended up walking out with a synthetic flat blusher brush. I couldn't help it! I had the skunk brush ($12.99) in my hand but Target has a display where you can touch samples of some of the other brushes and I kept petting them. The flat blusher brush ($14.99) is intended for cream blush but I want to use it for my mineral makeup. The head is small and dense and incredibly soft. I couldn't believe anything synthetic could be so soft. I took it out of the plastic case and petted on it during the drive home. So soft. I washed it with my castille soap cleanser and am waiting for it to dry to so I can use and review. It didn't shed a whisker during washing. 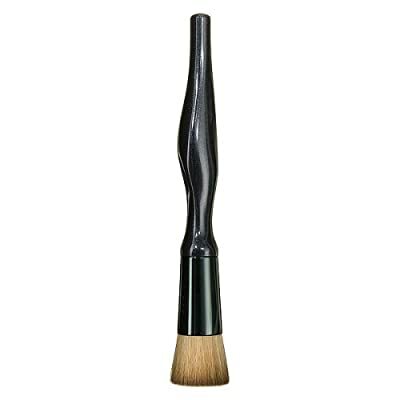 It is extremely thick and will take longer to dry than your other brushes. All Sonia's brushes appear to be 10% this week at Target, so now would be a good time to drop by and pet a few for yourself. Here is the selection available online; skunk brush and some others are available instore only. Sonia Kashuk brushes. i really want to try these brushes !! !